Dinesh Subasinghe who carved his niche in the Sri Lankan music arena by shedding light on the music played by ancient musical instruments like the Ravanahatha or the Ravanastron had released the island’s first ever Buddhist oratorio. Titled The Buddha: River of Kindness this CD is said to comprise the first philosophic piece of musical work since Master Premasiri Khemadasa’s cantata on Buddha’s Pari Nirvana. The CD encompasses 12 pieces of enthralling music strummed by Dinesh. It is a mixture of many musical genres from the western and Indian classical to Sri Lankan folk, pop, Tibet, Japanese and Chinese styles with Buddhist chanting in the backdrop. The piece is his first exclusive work of art since coming down for a break from the A R Rahman Academy, India. Taking on a road less travelled Dinesh notes that his aim is to create heartfelt tunes with his own unique imprint. He is not a part of the rat race for fame because he takes extra care to give his best for each track rather than dish out a CD while in the heights of fame. Music is a medium, much like a language, in which he hopes to communicate with the world. It has no specific borders for it is something which everyone can relate to. 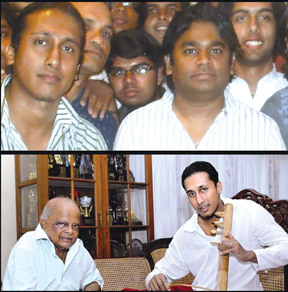 His main goal is to show the musical potentiality of Sri Lankans and bring honour to his motherland. “I have included soothing music in The Buddha: River of Kindness. ‘Music Therapy’ is a good mode to relieve stress. My prime objective it to take this to universal level so that globally renowned orchestras will be playing the tunes commemorating Sri Lankan music,” the youth opined to Daily News ‘Artscope’. Topping his first year foundation program with an A Grade, Dinesh was one among a few who got the opportunity to work with Raheman on his nursery rhymes audio CD. The nursery rhymes in the CD were narrated by Bollywood starlet Katrina Kaif. He played the violin, Ravanahatha, Kingiri and Ekthar for the CD and was also a member of the orchestra for Mani Ratnam’s Raavan. Last year he turned another new leaf in his career by composing a one string quartet named The Night Before the Battle, a sonata from a cello, violin and piano titled Ignored and a symphony, Land I saw, Land I Dreamed. Dinesh was one of the youngest composers to write a symphony at the age of 31. Speaking about his recent achievements Dinesh related that he also wrote Princess of the Lost Tribe, a Capella, for Menaka singers, a choir trained and directed by Menaka de Fonseka Sahabandu for their September Song concert last year. He is presently engaged in composing a piece for Bridget Halpe’s choir. The Yanni holiday celebration community selected three musicians from the world to create promotional songs for Yanni tours and Yanni fans in the US and Brazil. Dinesh was elected for the deed and he chose Tharindya Amaratunga from Kandy and Abigael Elisha from Negombo, both choristers from Bridget Halpe’s choir, for the track. He had also composed tunes for a number of teledramas which are being telecast and more which are queuing to unspool on TV. Reflecting on the roots of his musical career Dinesh notes that there were many people who had wished him well. He is especially grateful to Tharunyata Hetak Chairman and Hambantota district Parliamentarian Namal Rajapaksa, Minoj Silva and Aruna Priyashantha for their support. Dinseh’s latest CD, The Buddha: River of Kindness, will be available at leading bookstores soon.